Two estranged cousins, Ryan Marshall and Jarrod Conrad, must overcome their longstanding mutual animosity and band together to defeat a common foe in the high-octane page-turner The Fourth Law by Paul Stein. An evil mastermind, Alastair Holloway, steals the revolutionary invention of Jarrod Conrad, an antigravity machine, but manages to pin the blame on Jarrod’s cousin, Ryan Marshall. When the two embittered cousins realize they’ve been duped, they reluctantly join forces to fight back against their wicked archenemy. But are they any match for diabolical Holloway and a gang of ex-military mercenaries, who plan to steal one billion dollars in gold bullion from Fort Knox with the help of the antigravity technology? Full of larger than life characters and written in the vein of the great thrill masters Tom Clancy and Robert Ludlum, The Fourth Law mixes science fiction and corporate espionage with wit and panache. A thinking person’s sci-fi adventure, The Fourth Law explores the Grand Unified Theorem of astrophysics. But The Fourth Law is also a deeply felt character study about the bonds that tie family members together, and how the force of good might triumph over the darkest most sinister evil. Full of plot twists and turns you won’t see coming, The Fourth Law is a dramatic thriller that will have you guessing from the first page to the last! Fast paced and action packed, this book has all the makings of a hit movie and I wouldn’t be at all surprised to see it on the big screen. Paul Stein is masterful at weaving elements of intrigue and suspence, and intellect and technology with basic human needs for a family unity. He builds his characters with depth and insight. You will either love or hate them, but you remember them. Bravo for this first book, I can’t wait for the next – you get two thumbs up here! I have been looking for a new author, being weary of the spate of cookie cutter plots, superfluous mayhem and gore. I am delighted to say i have found one. Paul Stein’s first novel, The Fourth Law, combines suspense, mystery, excitement and a bit of education in this engrossing story. I enjoy Mr. Stein’s easy and educated writing style. I’m looking forward to his layman’s explanations of the first three laws. Put me on the list for the next one. I just completed “The Fourth Law”. What a neat book! As good, if not better than, “The DaVinci Code” or “The Girl Who Kicked the Hornet’s Nest”. This story comes at you on many levels within a charming prose style. Part exciting adventure/thriller, a mystery, a love story-romance, with diverse, intriguing characters, interesting science, an encyclopedic tour of geography, government, hi-tech, business, academia and law enforcement, all keep the pages turning with delight, curiousity and anticipation. Fun to read but with a serious, meaningful message about family, personality, and relationships. Wow! What an exciting story… kept me guessing and on the edge of my seat. So thrilling I did not want to stop reading… even to sleep!! A must read!! Can’t wait for the next book from this author!! What a collection of characters that lead you on to their dreams and the authorities where constantly right behind them. It kept me engaged until the very end. It still is amazing that this was Paul’s first novel. Pretty Damn Cool! Looking forward for more from this author. As I neared the end of the book I had to pace myself. I was torn between wanting to rush to the end and savor this great read. I started by savoring the read; but in the end, devoured the book to the finish. I could actually feel my own adrenaline rush as the final scenes played out; that is good writing and on a “freshman” attempt at that. I cannot wait to see what Paul Stein brings us next. I thoroughly enjoyed this book! It is well written and flows very well, had a hard time putting it down. The book reminds me of a high tech John Grisham novel. The multiple plot lines kept my interest and Stein did an great job of bringing it all together in the end. If this is Paul Steins first effort, I can hardly wait for the next one! Although I am a voracious reader, I rarely write (or read) reviews. I know what I like and don’t like and reviews from people I don’t know don’t change that. That said, I decided to review this book because, while the subject matter appears at first glance to be heavily scientific which is not my normal genre, the book is actually a very well-written thriller. I’m glad I gave it a chance on the suggestion of a friend. I don’t want to give away any secrets, so I’ll try to stay general. Yes, there’s technical scientific information and theories in the book – but a layperson will find it so well written that you will actually be able to learn – rather than be put off by – the information that is beautifully woven into a story that will leave you on the edge of your seat, or if you are like me, up waaaaaay too late at night because you want to know what happens next! Exciting to the end, with well-developed characters and settings that put you right into the story. I was left wondering one thing – when’s the next book coming out, Mr. Stein? Being a huge fan of great character development and one who desires detailed descriptive stage setting, this read hit on all my need cylinders. If you are a fan of Baldacci, Patterson or Clancey this novel should be in your must read library. Edge of your seat one moment, focusing on identifying carefully and strategically hidden hints the next and then reflecting on the strength of family ties. It hits the whole gambit of sensory buttons. I will be one of the first in line at the box office. Don’t miss out on adding this author to your list of favorites. This fast-paced action thriller is based on an intriguing concept: manipulation of gravity. It is a great adventure with a tight plot and interesting, well-developed characters. The family dynamics are something everyone can relate to in their own life. The “who-done-it” aspect is fun to try and figure out; the action keeps the story moving along at a rapid pace before the perfectly crafted crescendo. The possibility of an anti-gravity machine is stellar science fiction; the potential to use it at Fort Know is genius. Well done, Mr. Stein! Very interesting concept. Well written, good at keeping the reader interested. No doubt I would read his next book. Foreword Clarion Review: The Fourth LawPaul Stein’s first novel, The Fourth Law, encompasses blood rivalry, physics, high-tech robbery, villains with schemes worthy of James Bond, and the power of family, love, God and forgiveness. Stein’s science, even that of the anti-gravity machine, appears meticulous and credible. He also creates rich, interesting backstories about the immigrant ancestors of his main characters, so the audience becomes intimately acquainted with each character. 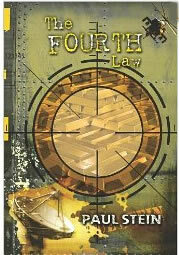 The Fourth Law marks an ambitious and mostly successful debut for this new author.